Hundreds of service personnel aboard HMS Ocean are arriving in Devon after serving more than four months in the Gulf. The crew of the Royal Navy's largest warship are preparing for a jubilant homecoming from the war on Iraq. Well-wishers packed the jetty at the ship's Plymouth base, ready to cheer the assault ship when she comes alongside on Wednesday morning. 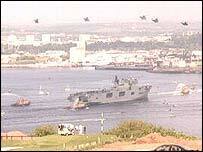 About 360 of Ocean's crew members will be reunited with their family at Devonport Naval Base on Wednesday. Speaking on board the ship before she sailed into Plymouth Sound, her commanding officer, Captain Chris Clayton, said she had made a "vital effort in securing southern Iraq". "She has performed brilliantly," he said. "Ocean was a major component of the assault on southern Iraq and particularly the Al Faw peninsula in those first three days." He said of the ship's company: "Without doubt, they are all stars. "The mood on board ship is euphoric but their pride is tinged with a bit of sadness as they remember that not everyone is coming home." Armed Forces Minister Adam Ingram was on board the ship to congratulate her captain and crew. HMS Ocean set sail from Plymouth on January 16 carrying 300 Royal Marines from Taunton-based 40 Commando and 400 air crew along with her 350-strong ship's company. During the conflict in Iraq, she was a platform for 22 military helicopters, all of which flew off the vessel earlier. After visiting HMS Ocean, Mr Ingram flew on to RFA Argus, a hospital ship which has accompanied Ocean since January. During the conflict, her 200 Royal Navy medical staff treated both coalition and Iraqi casualties. RFA Argus and her 150 crew are due to return to Devonport naval base on Wednesday afternoon. She will be followed by RFA Fort Rosalie, which provided supplies of food and fuel throughout the operation.